GAAD's purpose is to get people talking, thinking and learning about how to make digital (web, software, mobile) tools accessible to users with different abilities. According to Merriam-Webster, accessible means "able to be reached or approached." 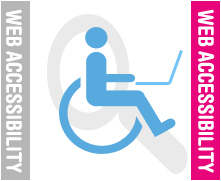 For people working in the web design, development, usability, and other related communities, accessibility means that what they build, shape, and fund should be able to be seen, used, and understood by as many people as possible– including people with disabilities. The reality is that people working in these communities often do not know how or where to start. Says Joe Devon, whose blog serrved as the inspiration for GAAD, "Awareness comes first." Attend a public event or other activity taking place to mark the day. Show your support by liking GAAD's Facebook page. Learn More about Accessibility and about the organizations that are working to make internet applications more accessible to people with special needs.